Since I can't always get away, there's always a book to escape into. Am I right? So I thought I would share a list of books I'm looking to read this summer. Who knows? Maybe you'll find something you want to read too. If you can't get on vacation in the next few weeks, you know what they say: a book is the next best thing. Into the Dreaming by Karen Marie Moning - Man in a kilt...do I need to explain further why I want to read this book in Ms Moning's Highlander series? Can't wait to be whisked off to Scotland! Notice by K. Webster - Holy Stalker alert! The blurb for this book!!! "I need to know everything about her. Her past. Her present. The way she takes her coffee. Exactly how she smells after a spritz of perfume in the mornings." It absolutely hooked me in and I've needed to read this since yesterday. Dark Lover by J. R. Ward - Who doesn't need some paranormal, bloodsucking hotness from time to time? I'm so excited to start The Black Dagger Brotherhood Series! Mack Daddy by Penelope Ward - I've mentioned on my blog before that I adore Penelope's writing. So this list wouldn't be complete without one of her novels. I've been saving space in my beach bag since I've heard about it! If you have any reading recommendations for my next beach trip, please feel free to share! Comments are open below. Here's to hot romance, a cold drink, and making the most of the down time we find! I can't believe it's already been a week since the release of KEEPING HIS COMMANDMENTS. I've been keeping busy with some new writing (as you can see from my celebratory spirits) but I still want to talk more about the behind-the-scenes about writing Eva and Jamie's story. I have a lot of favorite authors, and one of my features I look for on websites is music inspiration. I especially like how Molly McAdam's posts a new song every single day on her website. Whether I'm locked in my room typing away or just daydreaming in the car on my way to work, music is always a part of my writing. So I thought I would share a 13-song playlist inspired by Jamie and Eva. No surprise that I have a little Bruce Springsteen on the list, but I was more shocked than anyone to add a country song to the list. I don't generally gravitate toward country at all but this particular song wouldn't leave me alone. Without further ado, the Keeping His Commandments Official Playlist. I hope as we get closer to the weekend, you find a new favorite for your own writing inspiration or maybe your next workout playlist. Release Day for Jamie and Eva! I've been so excited and anxious for this day. 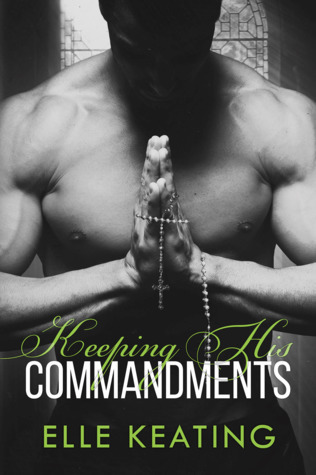 KEEPING HIS COMMANDMENTS -- the first book I've self-published -- is out in the world TODAY. It's a long time coming; my last book came out in early 2016 and since then I've been reading a ton, finding my writing spark, and also (as you can see from this website), trying to figure out how best I can communicate with readers and other romance novel lovers. Forbidden romance storylines have always lured me in. The angst, the stolen glances, the heroine's fear that she's going to go to hell in a handbasket if she has just one more impure thought about the hero... I search high and low for these types of books. The moment I picked up Colleen McCullough’s The Thorn Birds, I was hooked. I also cried a lot. Crying, sobbing, nose running… lost it. But as much as that story broke me, I wanted more. I wanted to read about characters who often lived by Murphy’s Law, characters you wanted to scream at one minute for being so damn clueless and cheer for the next. Penelope Ward's Stepbrother Dearest put me on an emotional rollercoaster that I never thought I would get off of. One minute I was flying high, convinced that the hero had seen the light, only to experience the unhealthy desire to strangle him. But I love the rush. The way I’m emotionally drained after reading one of Ms. Ward’s books. She guts me every time, and I adore her for it. Since I love to read stories that can twist your stomach into countless knots, I decided to make a go at it and try to write one of my own. I apologized often to my characters as I penned KEEPING HIS COMMANDMENTS. Watching Jamie and Eva struggle wasn’t easy, but I knew they had to if they were to come off as believable, and more importantly, imperfect. I grew up in a Catholic household, went to Mass every Sunday and observed the traditions. As a teen, I was intrigued by the idea that priests were forbidden to marry. They were human after all, so the question I always wanted to ask, but didn't, out of fear of sounding blasphemous was: How does one live a celibate life and avoid temptation, especially when it seems to loom around every conceivable corner? When I became an adult (and grew a little bolder) I had a conversation with a priest and touched on this subject. "Loneliness," he had said. That was what he had struggled with, especially at the holidays. That word stayed with me as I developed Father Jamie Curran's character. So did the word, "human." It was important to me that he'd be betrayed as such. And that by the end of the story, the reader would understand both the man and the priest. I truly hope you enjoy it. Many glasses of wine and cups of coffee are to thank for getting me through the writing process.